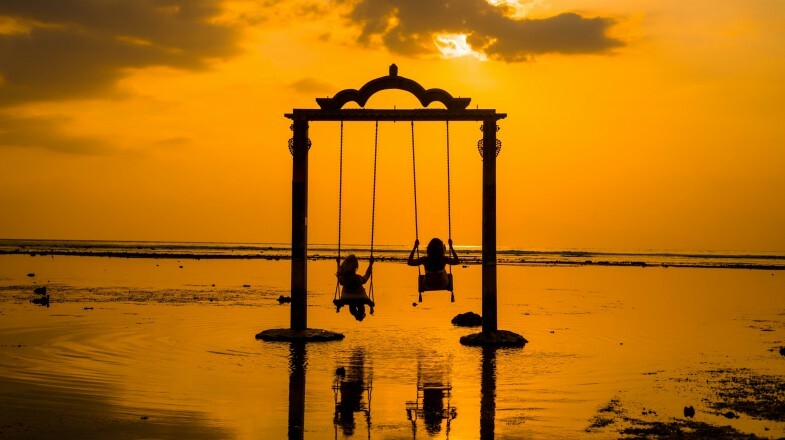 Find the ocean swings on Gili Trawangan for an Instagram-worthy shot. Lying 30-minutes off the northwest coast of Lombok, Indonesia in the azure waters of the Bali Sea is the Lesser Sunda Islands archipelago which is home to a small group of islands known as the Gili Islands — Air, Meno and Trawangan. The three picturesque islands have become a hot spot for adventure seekers who are looking for a slice of paradise while indulging in an assortment of superb things do on Gili Trawangan. Once you arrive on Gili Trawangan you will find a bohemian lifestyle with bustling streets filled with bicycles and hip tourists along the more populated eastern shores. Here the island is packed with lounges, a wide variety of restaurants and plenty of quaint places to stay. The western and northern shorelines offer secluded white sand beaches and excellent water conditions to satisfy the hunger of all types of water enthusiasts. After discovering the lay of the land you will be amazed at the all the activities on Gili Trawangan that range from snorkeling to scuba diving to surfing to just walking the island while you have fun in paradise. Here is a quick look at the six best things to do on Gili Trawangan. 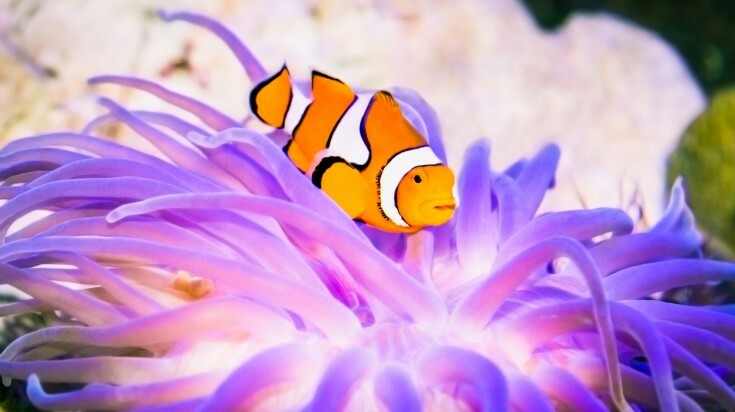 Find Nemo while diving in the waters of the Gili Islands. Gili Trawangan is surrounded by idyllic azure coloured waters which make snorkeling and scuba diving one of the best things to do in Gili Trawangan. Underwater enthusiasts will find a plethora of tropical fish and brightly coloured corals within the numerous offshore reefs to explore. 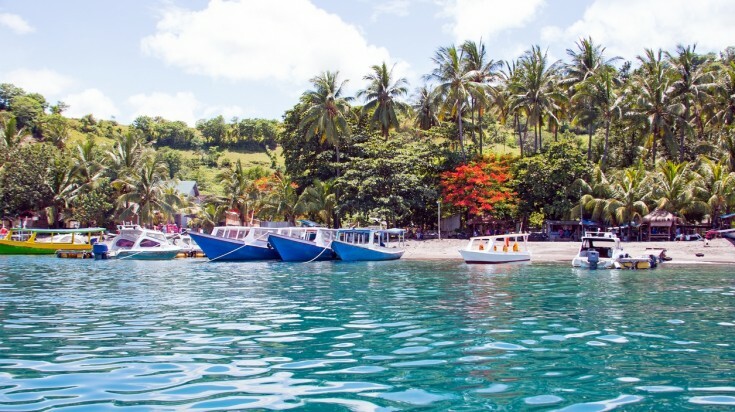 Divers will be pleased with top dive spots like Manta Point filled with large manta rays and Shark Point which is perfect for diving among black tip sharks. Snorkelers will marvel at the beautiful underwater delights at Simon’s Reef as well as almost any offshore spots of the islands. You can take a quick boat ride to Gili Meno where you can go swimming with the turtles at Turtle Point. Gili Trawangan boasts Wreck Point at Mentigi Beach where divers will be fascinated exploring a sunken WWII vessel. The island sports a laidback attitude and exploring the island on foot is easy. The 15-square kilometer area of Gili Trawangan can be walked in under 2-hours. Along your way you can experience everything from 200-room resorts to beach shacks to chickens strutting down streets of sand. Stop at one of the cheap street side vendors for a quick bite to eat or a cold libation while you gaze at the beautiful tropical landscape and blue waters of the Bali Sea. Bicycle rentals are plentiful on the island and are the preferred mode of transportation. If you get tired of walking you can simply hire one of the cimodos — a horse drawn carriage to take you back to your spot on the island. 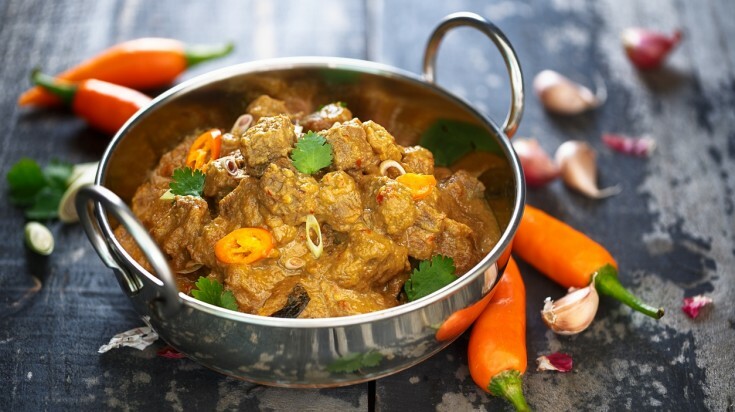 Learn to prepare divine treats like Beef rendang at a cooking class on Gili Trawangan. A fascinating thing to do in Gili Trawangan is to learn about the culture and history of the island through lens of a foodie. During your cooking class you will learn more about the inhabitants of the island, how the island was developed and more about the culture through the food. You can learn innovative Indonesia farm to table cooking techniques as well as feast on divine treats like beef Rendang, Nasi Rawon and Sweet Martabak. Indonesian cuisine mixes the influences of several cooking styles from countries such as France, China and India as well as other Asian countries. When you are thirsty, try a cendol or dawat which is a cold sweet drink made from coconut milk, rice flour, sugar and pandan leaves. Take one of the speed boats to move from one island to another. One of the more interesting things to do in Gili Islands is to go island hopping. All three islands are a must see while you are in the region. The smallest of the islands is Gili Meno where you will find the Turtle Sanctuary, where rescued baby turtles are raised and released on one of the old beaches. There is also the Gili Meno Bird Park which is home to peacocks, pelicans, raptors, parrots and pheasants. Gili Air is ideal for kitesurfing and stand-up paddleboarding with wide secluded beaches and wonderfully calm waters. Once on any of the islands you can quickly find a nice place to relax. Public ferry service leaves Gili Trawangan twice a day and travels to both Gili Air as well as Gili Meno. Other transportation options include renting a speedboat or you can choose to hire a speedboat for the day. Another perfect activity on Gili Trawangan is to hike to the highest point on the island. At 60m above sea level this unnamed point is packed with highlights. As you climb you will pass a strange white temple, a Muslim burial site and the remains of a WWII Japanese bunker. Once on top, your eyes will feast on panoramic views of the Bali Sea as well as Mount Rinjani on Lombok Island to the east and Mount Agung to the west on Bali. The island is believed to have been uninhabited until the Japanese arrived in WWII and transformed the island into a prisoner of war camp and a lookout. The name Trawangan is derived from the Indonesian word Terowongon which translates to tunnel. The island has numerous tunnels that were constructed during WWII by the Japanese. Party into the night at the beach in Gili Trawangan. 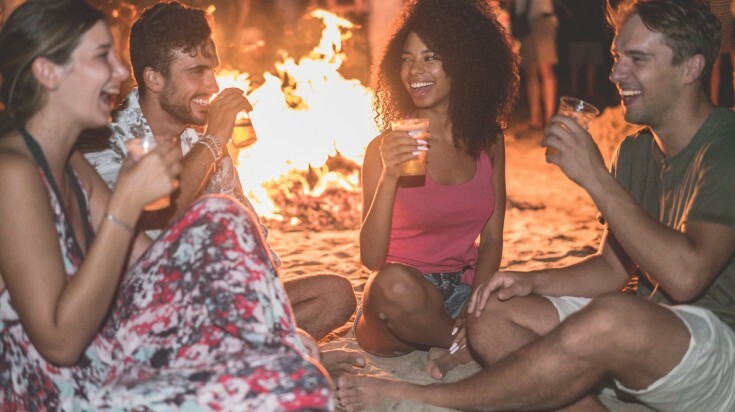 If you are still wondering what to do in Gili Trawangan then go out partying. The atmosphere is lively throughout the day and night. There are plenty of beach shanties sharing live music and hand crafting cold libations from pina coladas to daiquiris to locally brewed cold beer like Bintag, Bali Hai and Arak Bali. You might be surprised in the evening when several establishments regularly shoot off fireworks that glow in the gorgeous waters of the Bali Sea. Gili Trawangan is the smallest island in the world to boast an authentic Irish Pub known as Tir Na Nog. Be aware that drug offenders can receive steep penalties in Indonesia including the death penalty. Play with caution. Gili Trawangan is the largest of the three islands and sports most of the major attractions as well as amenities for travellers. Gili Trawangan is the only island with an active police force. With the three islands being a hotbed for backpackers there are numerous drugs for sale and you should be aware that Indonesian drug laws are very strict. In the end, Gili Islands are an ideal holiday paradise for all travellers from families to backpackers to honeymoon couples and the surreal area is sure to raise your sense of adventure. As you can see from the list above the numerous things to do on Gili Trawangan is plentiful. 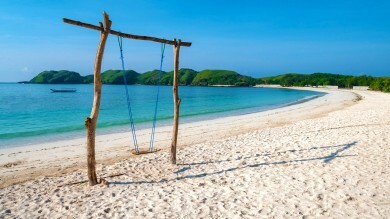 Travellers will find exciting water sport activities, superb secluded beaches, a laidback atmosphere and time to relax. Whether you are searching for an activity on land or in the wonderful waters of the Bali Sea there is something for everyone.